1901, Replica of the wind tunnel designed and built by the Wright Brothers in the fall of 1901 to test airfoil designs. 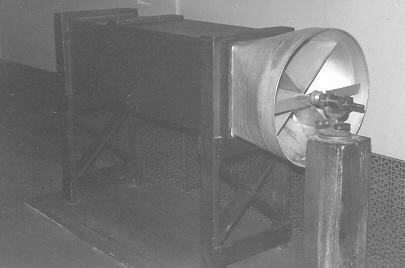 The blower fan, driven by an overhead belt, produced a 25 to 35 mph wind for testing the lift of various plane and curved surfaces. Aerodynamic tables derived from these tests were vital to the successful design of the Wright 1903 Kitty Hawk airplane. Inside the tunnel is a model of a Wright Brothers lift balance used to measure the lift of a test surface.